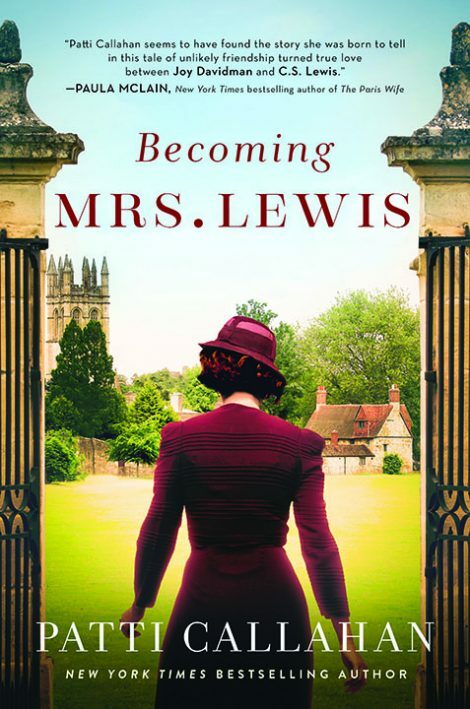 From New York Times bestselling author Patti Callahan comes an exquisite novel of Joy Davidman, the woman C. S. Lewis called “my whole world.” When poet and writer Joy Davidman began writing letters to C. S. Lewis — known as Jack — she was looking for spiritual answers, not love. Everything about New Yorker Joy seemed ill-matched for an Oxford don and the beloved writer of Narnia, yet their minds bonded over their letters. Embarking on the adventure of her life, Joy traveled from America to England and back again, facing heartbreak and poverty, discovering friendship, and against all odds, finding a love that even the threat of death couldn’t destroy. In this masterful exploration of one of the greatest love stories of modern times, we meet a brilliant writer, a fiercely independent mother, and a passionate woman who changed the life of this respected author and inspired books that still enchant us and change us. New York Times bestselling author, Patti Callahan was a finalist in the Townsend Prize for Fiction, an Indie Next Pick, and a multiple nominee for the Southern Independent Booksellers Alliance (SIBA) Novel of the Year. The mother of three children, she lives in both Mountain Brook, Alabama and Bluffton, South Carolina with her husband. 1. Did you know much about Joy Davidman before you read this novel? Did you come with preconceived notions of who she was? How did those change during the novel? What was the most surprising part of this story for you? 2. Not many people supported Joy’s choices to first travel to England and then move there. There also didn’t seem to be much support from Jack’s friends as their friendship and then love story blooms. How did Joy find the strength to overcome the resistance? How did they survive this disapproval to come together? What were the strengths that allowed them to resist the naysayers? 3. How did the time and place – 1950s England when women weren’t even admitted to Magdalen College where Jack taught – affect their love story? Would it be different today? How would this story be different today? 4. Joy often thought about her past—both her love affairs and her family life. How did the past influence her personality and decisions? How did it affect her self-esteem and self-love? How did she come out on the other side? 5. Joy and Jack enjoyed an almost three-year pen-friendship before ever meeting. Can friendships begin with words and notes? Can one become friends through letters alone? Can we be more vulnerable on paper than in face-to-face contact? 6. We meet many famous people along Joy’s journey —J. R. R. Tolkien, Travers, Belle Kaufman, Michal Williams and many others. How do these people influence Joy’s path to love? Were they as famous then as we deem them to be now or were they just other friends on the road to self-discovery? Did this ensemble of literary friends change Joy’s path? 7. Many of Jack’s last books, most notably, Till We Have Faces, were shaped by his friendship and love with Joy. Can you see her life and influence in his works written after 1950? If so, which ones and how? How did their co-writing, editing and long talks affect his work?